Versatile beads made from a wide variety of papers - glossy magazine pages, Japanese washi paper, wallpaper, gift wrap, and even newsprint or brown craft paper - are really popular right now. The sky's the limit on what handmade beads can look like and how they can be used - in bracelets, earrings, and necklaces for sure, but how about biggg projects like many long strings of funky beads used as a door curtain or perhaps metallic bead garlands to decorate a mantel or Christmas tree? If you've been thinking of giving paper bead making a try, a new tool developed by Just Jenn Designz looks like a surefire way to make a large batch without stressing your fingers in the process. A narrow slot grips the wide end of a tapered paper strip; just roll the handle and the result is a smoothly wrapped bead with a 1/8 inch diameter center hole. It's pretty, isn't it?! No boring, plain handle for this inventor. Jenn, a jewelry maker and digital paper collage sheet creator, enjoys graphics so much she's designed six handle choices for the tool. Jungle Wild = cute! 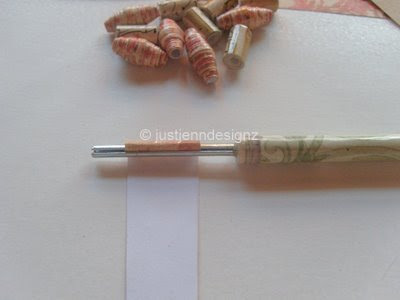 She's also written a tutorial [edit: post is no longer available] on paper bead making that she includes with the purchase of the tool or it can be ordered separately. I'm thinking bead making is a project that could keep crafty kids happy for long intervals this summer. You can reach Jenn at JustJennDesignz@gmail.com or visit her Etsy shop. Great tool indeed. I wish I had one about a year ago, when I was making beads with my kids :) BTW, we tried threading beads not only along the string, but also across (it's hard to explain), I think this gives unusual effect. Goodness, how lovely. And I've just watched those paper cutting/pop-up book videos - WOW! Hello, Everyone...Mzuribeads have been individually hand rolling paper beads to make unique pieces of jewellery from the village of Ndejje in Uganda for over two years. Anyone interested in the art of rolling paper beads should visit our website, where you can locate a stockist near you or goto our online shop to view and/or purchase our loose paper beads and paper bead jewellery. www.mzuribeads.com Thank you. The Uganda Women Empowerment through Crafts creates paper bead jewelry to help continue to educate, fee and shelter their children. What a fabulous tool! I'll have to upgrade soon and order a few of these for my handmade paper bead jewelry. Great ideat! Just got my tool yesterday, it only took a couple of days to get here, very speedy delivery. 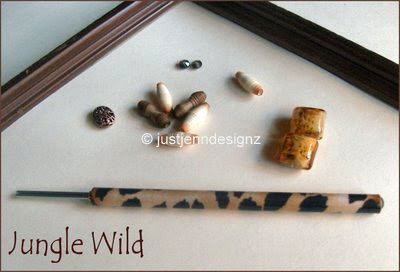 I really like Jenn's bead tutorial, and plan on cutting some paper when I get caught up on unpacking, so that the grandkids and myself can start making some beads. Thank you Ann, for the link. That's great to hear, Teddie, enjoy it!